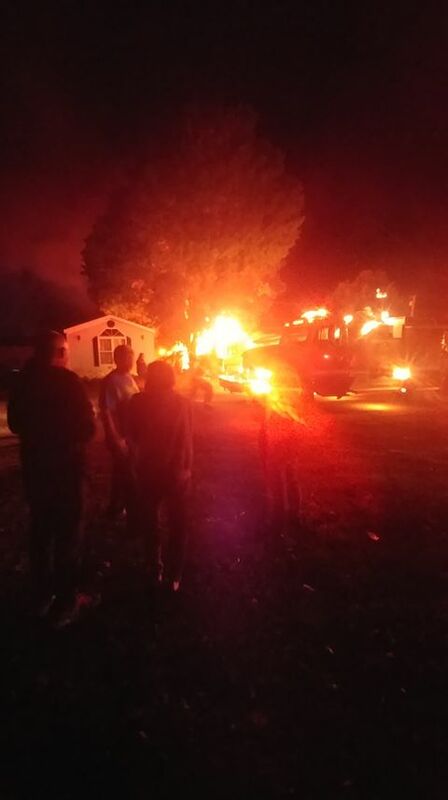 A Friday night mobile home fire in Milford is being investigated as suspicious. No one had been charged with a crime as of Monday. Milford Fire Department Chief Todd Haines said his department received the call of a fire on C.R. 1150 N in Milford close to 9:30 p.m. Friday. The fire started in the storage building next to the mobile home. It destroyed the shed and the mobile home, and caused serious damage to the mobile home on the lot next to it. There was no electricity to the lot where the fire took place as it had been disconnected Thursday, the mobile home park owner says. Haines said the shed and mobile home were probably a complete loss. Along with the Milford Fire Department, Plain Township and Turkey Creek Fire Territory fire departments provided tankers and Lutheran EMS was on standby. Assisting in the fire investigation are detectives from the Kosciusko County Sheriff’s Department and Warsaw-Wayne Fire Terrritory. About 20 firefighters battled Friday’s blaze.